Damages For Pain and Suffering - What Are They Worth? 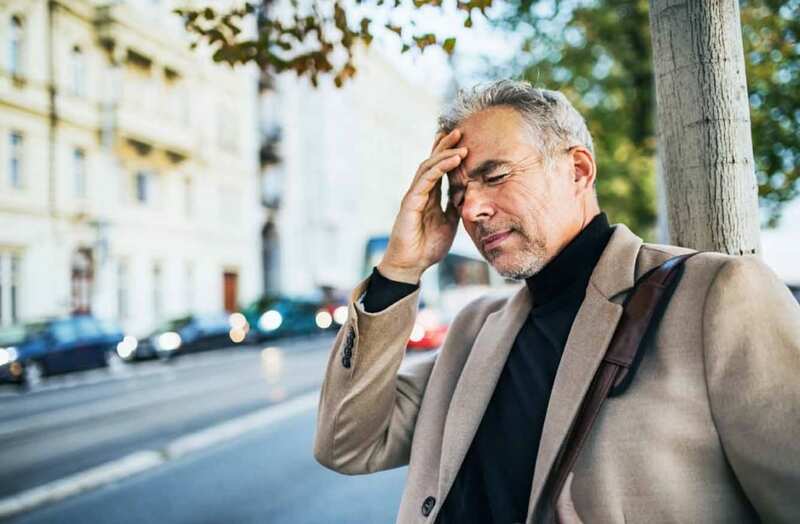 In slip and fall and motor vehicle accident cases, one of the primary ways for an injured individual to be compensated is through non-pecuniary or general damages for pain and suffering. These damages look to address the physical, psychological and emotional impact an accident has on an individual and subsequent injuries sustained as a result. Damages for pain and suffering can vary greatly from case to case depending on the extent and duration of the injuries. 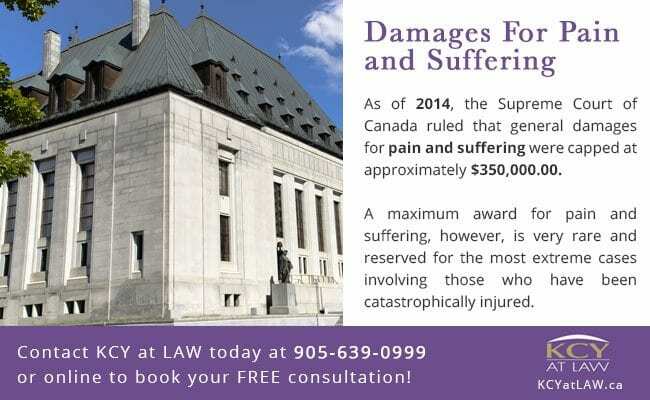 As of 2014, the Supreme Court of Canada ruled that general damages for pain and suffering were capped at approximately $350,000.00. A maximum award for pain and suffering, however, is very rare and reserved for the most extreme cases involving those who have been catastrophically injured. While one may think that this upper limit seems quite low, it is practically impossible to measure someone’s pain and suffering with general damages often being very subjective. By capping general damages at a specific amount, the Supreme Court of Canada has attempted to make quantifying general damages in any given case easier. Establishing how much any given case is worth regarding general damages is best achieved by looking at prior cases involving similar circumstances. Counsel on behalf of plaintiffs and defendants and the Courts look at prior caselaw involving similar injuries with similar impacts on the individual(s) in order to establish a range of damages for a particular matter. It is very important that the plaintiff understands how the law works and how our legal system values cases involving injured individuals. Often times, counsel for plaintiffs are required to wait several months following a motor vehicle or slip and fall accident in order to fully assess the true impact the accident has on an individual. This is especially so given that many psychological and/or emotional impairments are not apparently clear immediately following an accident and often arise many months later. Whatever the case may be, this concept and many other issues central to an injured person’s case can be best explained by the lawyers at KCY at LAW. We have the experience and expertise necessary to effectively handle your motor vehicle accident or slip and fall claim. 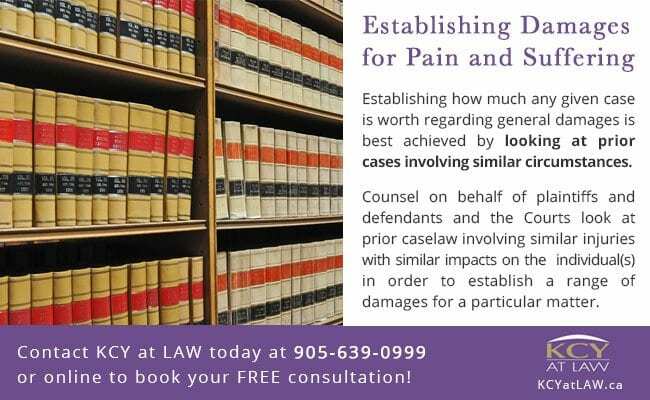 Contact KCY at LAW today at 905-639-0999 or online to book a FREE consultation! 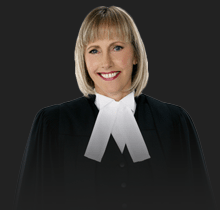 https://www.kcyatlaw.ca/wp-content/uploads/2016/03/Damages-For-Pain-and-Suffering.jpg 876 1336 Kathy Chittley-Young https://www.kcyatlaw.ca/wp-content/uploads/2018/01/KCY-at-LAW.svg Kathy Chittley-Young2016-03-02 19:08:532019-01-19 23:20:31Damages For Pain and Suffering - What Are They Worth?